Every week, National Geographic chooses between thousands of photo submissions from the general public to publish photos on their website and in their magazine. I have been keeping up with them over the last year and submitting some of my favourite pictures. 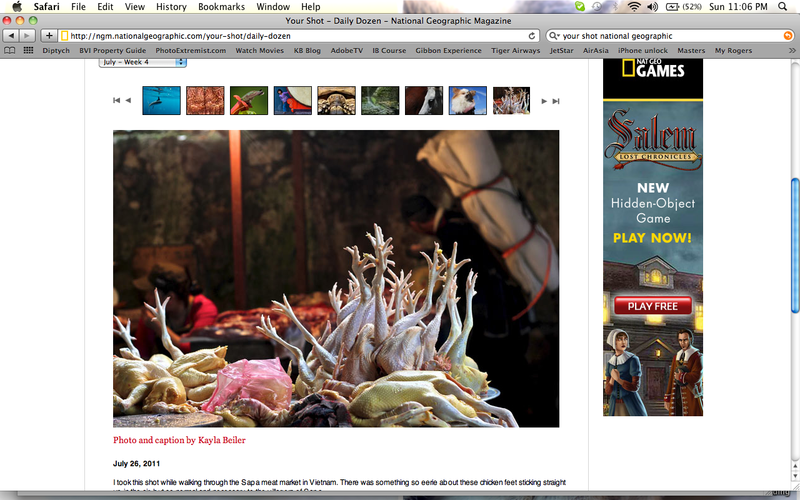 Well, I am happy to announce that this week they chose my photo of chicken feet that I took while visiting Sapa, Vietnam. It was one of my favourites and I am very very shocked to see it on such a world renowned photo publishing company. To see it it full action, click here -----> National Geographic, and look under July - Week 4. Scroll across to see the lovely chicken feet. It may make you want to become a vegetarian though!